Interoperability amongst public sector systems, services and data becomes a critical enabler for the digital transformation of public administration, the provision of new and user-centric public services, and for the implementation of the “once-only” principle. In March 2017, the new European Interoperability Framework was published by the European Commission introducing new elements and setting new requirements for the member states. Interoperability and the EIF also appeared as a strategic component in the eGovernment Tallinn Ministerial Declaration. In this workshop, the new EIF will be presented by a European Commission representative. Moreover, experiences from several initiatives to promote interoperability in different areas including eID, eDelivery, and eHealth will be presented. 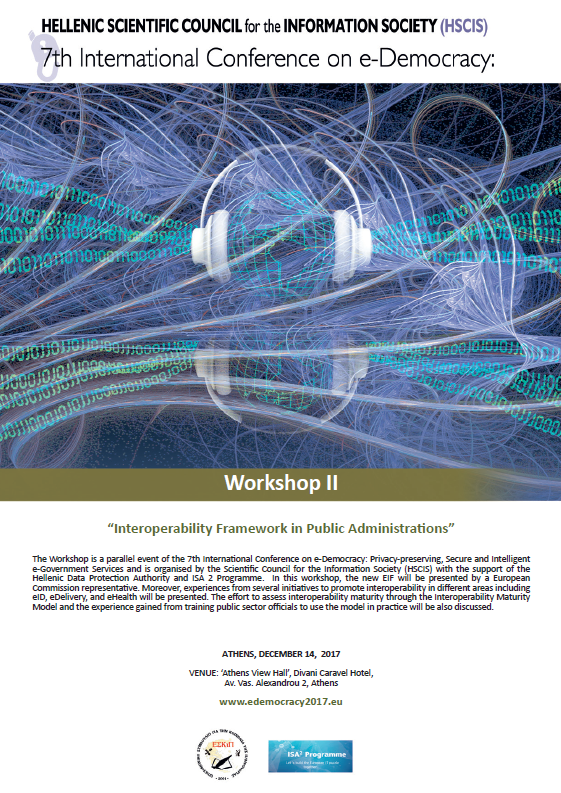 The effort to assess interoperability maturity through the Interoperability Maturity Model and the experience gained from training public sector officials to use the model in practice will be also discussed. The workshop is structured in two sessions: the first part will be focused on presentations, while in the second part a panel discussion will be organised to elaborate on challenges and good practices in applying the EIF and promoting interoperability in practice. This session will provide an overview of key aspects of the new European Interoperability Framework. Specific highlights will cover how MS can get insights into two key aspects of their interoperability performance through the Interoperability Maturity Model (IMM) . The ability to share medical data and connect places where healthcare is provided is expected to close the gap that traditionally limits the provision of high quality health services. The presentation focuses on the current status of use of Electronic Health Records in Greece, paying emphasis on eHealth Interoperability aspects. Recent developments are presented and the need for the establishment of national eHealth interoperability framework is highlighted. The presentation focuses on the Greek Municipalities Interoperability Hub, which is developed within the Greek Government Cloud maintained by the Ministry of Finance. The Municipalities Hub, designed by the Greek Digital Governance Research Centre in collaboration with the Union of Greek Municipalities, provides universal access to web services in several hundreds of municipality staff, assisting everyday operations and being a gateway for new electronic services for administrations, businesses and citizens, at local government level. The implementation of eIDAS regulation in Europe has proceed. A lot of implementing acts have been published regarding eID and e-signature. Further work is required for e-delivery. Some countries have already started the process for notification or pre – notification of their national eID schemes. The eIDAS node implementation in many countries has started and it is being supported by the Connection Europe Facility programme. Conformance and connectivity tests are being offered as a service for Member States and Vendors by European Commission regarding eID and e-delivery. This tests have been successfully by many countries. Further work is still required in the context of mandate and additional domain attributes therefore studies on this issue are being deployed. Additionally some important examples will be presented relate to the public sector. Current results related to the once only principle project will also be presented regarding eID and e-delivery. The presentation focuses on the Ministry of Finance Interoperability Center, which provides a Common and Unified infrastructure for web services hosting and usage. Web Services exchange business information between public authorities in order to provide electronic services. Τhe data is not restricted to the Ministry of Finance but also involves a number of other Public Authorities. The presentation focuses on “Interoperability Maturity Model –IMM” training program, which is developed by the National Centre for Public administration in cooperation with ISA. Methodology issues, delivery techniques and implementation actions from EKDDA will also be presented.